Nothing warms up the heart like good old memories do! With all the near and dear ones around, Easter seems like the perfect time to indulge in some nostalgic trips down memory lane. Help your 3rd grader dream up the past. 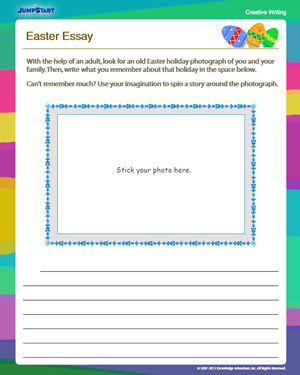 Get her an old and happy picture of a bygone Easter and encourage her to write all that she can remember of that holiday. Inspire her to borrow heavily from imagination and make this third grade Easter essay as creative, fanciful, vivid, or whimsical as she likes! This is a great practice to help young 8 to 9 year olds boost their confidence in their writing skills as well as improve their vocabulary and spellings.